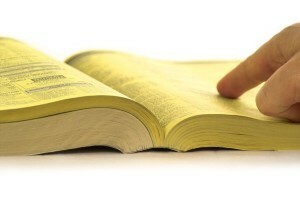 When was the last time you looked up something in the Yellow Pages? Or any printed directory for that matter? I actually had to do it the other day but it was the postal code book at the post office and I had to do it because my parent’s postal code, in Ontario, shares the last 3 digits, in reverse, with my brother’s. Which means that every single time I ship a package to my parents, or my brother, I have to look up the postal code because I can NEVER remember which is which. Most people you speak to nowadays refrain from using the Yellow Pages or White Pages to look up a business. When the books are delivered there is a very good chance you’ll see the road-side recycling boxes filled with Yellow on the next pick up day. As for a means to advertise your business? It was my personal experience, many years ago when I first started my first offline venture, that the Yellow Pages are over-priced and under-utilized. There certainly exist a demographic that still rely on the Yellow Pages to look up business information and if that is your target market you might consider the Yellow Pages a good place to reach them. However, if you are more interested in laser targeting your audience, attracting new clients to your business, and growing your list, your money would be much better spent attracting customers through Social Media. The word “attract” is the key to Social Media. The more value you provide, the more eyes you will attract and the more people will refer you. It’s as simple as that. The additional benefit of Social Media over traditional Yellow Pages advertising is cost for value. With a Yellow Pages ad you present 1 face of your company to the public. That ad is static and does not change throughout the shelf-life of the publication. You have no control over how that ad attracts once it is published. However, if you engage in a Social Media campaign you can track your visitors. Determine which ads or wording works best for you and adjust accordingly. The Yellow Page companies have been scrambling, trying to catch up to the Social Media sites by offering online listings when you purchase a print ad. The idea is good in theory but it’s not until you go to the site that you realize it’s the businesses that pay a premium that get the featured listing and your company is buried deep down. Again, you have little control over how you are presented when dealing with the Yellow Pages. When people look up a business online they type the name of the business into a search engine. The company with the best search engine optimized site comes up first. What does your marketing campaign look like? Does it include a professionally planned Social Media strategy? If not, you’re missing out on massive traffic. And where is your copy of the Yellow Pages right now? I’d be interested to hear your thoughts on the Yellow Pages vs Social Media. Comment away!